multiplied by pet per line. Highest win only on each line. Maximum win per paid spin is 40,000 times per line. -One of 3 features is triggered when the koku appears on reel 3 with 2 or more ronin anywhere. Reel 3 in held,with koku appearing on all positions,while the other reels respin from 3 to 10 times. 2 or more Ronin appearing on a respin awards an extra 3 to 10 spins. -5 free games in Ronin slot game are awarded, during which prizes are multiplied by 1 in the 1st game, 2 in the 2nd game, 3 in the 3rd game and so on. Any retrigger will award 5 extra free games. 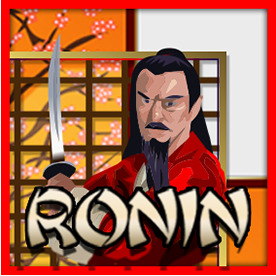 The feature in Ronin slot game can only retrigger once, and will result in the prize multiplied continuing to accrue. -25 free games are awarded during which prizes are tripled. Any retrigger awards 25 extra free games.